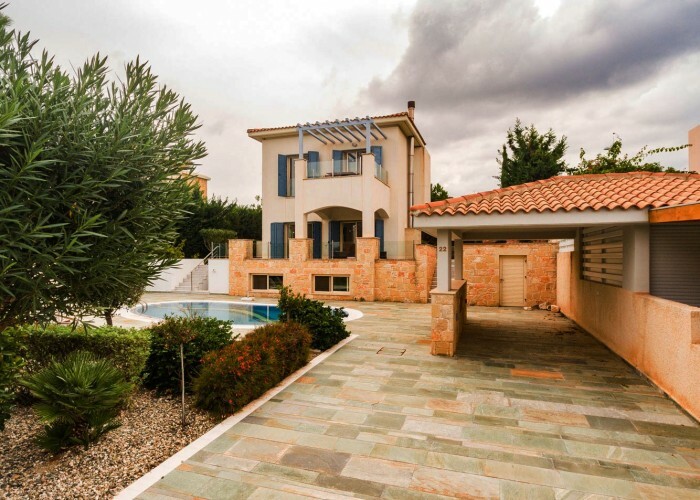 This luxury 3 bedroom detached villa with Title Deeds is a three minute walk to the beach in Neo Chorio, which is the most prestigious area of Polis and Latchi. It is less than one minute’s drive from the internationally renowned Anassa hotel and is part of an exclusive, secure gated development with its own tennis court for the exclusive use of residents. Located in a cul-de-sac within the development, peace and quiet are guaranteed as there is no passing traffic and the local sandy beach is only 3 minutes’ walk away. There are 2 entrances to the grounds of the villa. The first is via an attractive gateway and past the overflow pool to the front door. The second is via double gates which lead to a covered car port and then on to the villa Covered parking is almost an essential for protection from the fierce Mediterranean sun. Both the interior and exterior of this property ooze style. From the stone clad finishes overlooking the pool to the top quality interior finishes the superior nature of this property is patently obvious. Bear in mind the high quality wood effect cupboards and wardrobes, to the marble staircase and marble ground floor. The kitchen/lounge/diner is open plan. The very well equipped kitchen includes 2 sinks, a washing machine, oven hob and extractor as well as a fridge/freezer. Each of the white goods is a HOTPOINT ARISTON model.Two steps lead down to the lounge/diner. The lounge has a 4 seater settee, 2 armchairs as well as a d flat screen TV. Incidentally Wi-Fi is fully operational here. Another feature worth mentioning is the subdued lighting which can be controlled to enhance whatever atmosphere is required. The dining table is easily large enough to accommodate 6 people and patio doors lead from the lounge to the large veranda. This is where the property moves onto an even higher level. The views from the veranda are simply superb as they include the stunningly blue Mediterranean Sea and the western tip of the island – the Akamas National Park. The veranda currently holds numerous easy chairs and other furniture designed for outdoor living. Just imagine sitting here enjoying a pre-dinner brandy sour and watching the sun sinking slowly in the west. A guest cloakroom completes the rooms on the ground floor. The master bedroom has a dressing area, plenty of wardrobe space and an en- suite shower room complete with w.c, sink and state of the art vanity unit, There is an outside balcony where you can enjoy the stunning views. The second bedroom has an en suite bathroom, plenty of wardrobe space and a full length window giving stunning sea views. The villa is constructed on 3 levels and on the lower level is a fully self contained separate apartment. This includes an open plan kitchen/lounge/diner – all superbly equipped and finished, a very spacious bedroom and extremely modern bathroom. The property has been finished with the idea of Mediterranean living of paramount importance. As well as the large veranda there is a covered area to the side of the property which offers welcome shade from the constant summer Cyprus sun. The grounds of the property are tastefully designed with a fully landscaped private garden and delightful shrubbery surrounding the crystal clear large swimming pool. There are large terraces around the pool giving plenty of room for sunbathing in the constant Cyprus sunshine. Neo Chorio, which is on the boundary of the Akamas National Park lies 5 minutes to the west of the upmarket Marina at Latchi with its numerous fish restaurants, exciting water sports activities and crystal clear waters and only a 10 minute drive from the banks, supermarkets, and many other facilities in Polis.